As people of faith and members of compassionate and caring communities, we support measures to insure the health, safety and well being of all. We believe that criminal justice must focus on prevention, conflict de-escalation, compassion and rehabilitation. Don’t miss the 5th Climate Assembly: Climate Impact & Environmental Inequity in Orlando on Feb. 1-2. Register here. It is of critical importance for members of UUJF to participate in this year’s Legislative Days Events in Tallahassee on Monday and Tuesday, March 11-12, and to sign up ASAP. Members of Indivisible groups around Florida will join with us at UUJF Legislative Days. We need to know how many spaces we can save for them for dinner and lobby training Monday night, but we want to accommodate all interested UUs before opening up those spaces. We will be joined in the Florida State Capitol on Tuesday, March 12, by members of Indivisible, The Florida Rights Restoration Coalition, National Council of Jewish Women and Equality Florida followed by members of the ACLU on March 13. A large turnout by UUJF members along with members of these other pro-active, like-minded organizations will insure that our voices for progressive legislation to advance social, economic and environmental justice will be heard and noticed by our elected Representatives. Click here for Program information and Registration. UUs: Please register now. In the meantime, schedule your pre-session meetings with your representatives and ask for their commitment to support our core issues on the UU Legislative Agenda. Sarasota, Friday, February 1, 10:00 am - 11:30 am - appearing with Stephanie Fraim, CEO of PPSWCF. Rev. Dr. Rebecca Todd Peters is a nationally regarded feminist and Christian social ethicist. Peters will discuss her new book, Trust Women: A Progressive Christian Argument for Reproductive Justice (Beacon Press, 2018). First "Immigration Counseling" session led by Sister Maureen Kelleher, attorney, immigration justice advocate. Feb. 4, 1:00 pm – 4:00 pm Registration required for counseling sessions. What would you like to tell your new members of the U.S. House of Representatives? Concerned about rising sea-levels, health care, immigration or other issues? With the start of the new 116th Congress now is the critical time for UU Floridians, with five new U.S. Representatives, to share their wishes and concerns. 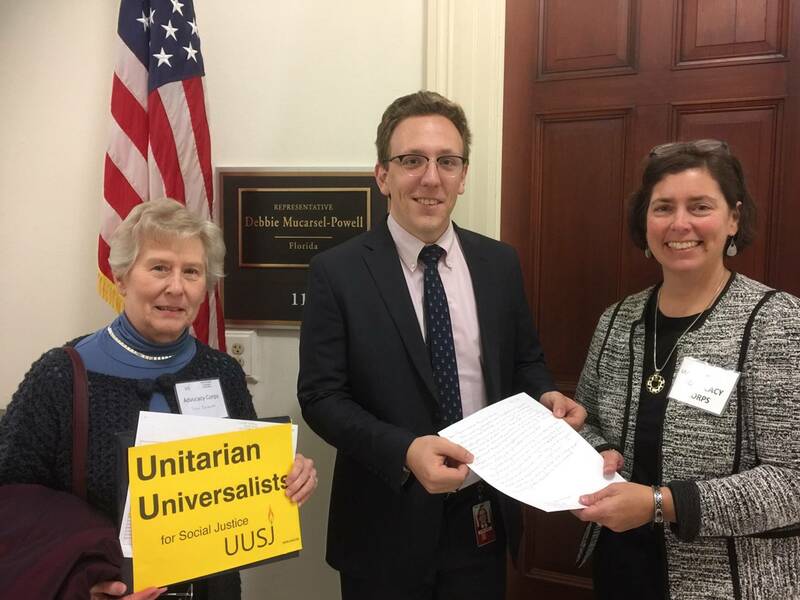 The UUSJ’s Capitol Hill Advocacy Corps (goes to the Hill monthly) will deliver UU’s personal letters on Feb. 12. Interested in hosting a letter writing event at your congregation now or in the future? Here’s the “how to” UUSJ WHWN Toolkit for Letter-Writing Campaigns for organizers. UUSJ will join the “Climate Impact and Environmental Inequity” assembly in Orlando Jan. 31 - Feb. 1, where UUSJ will promote its Write Here! Write Now! Campaign. Hope to see you there! On Feb. 3, “Letter-Writing as a Spiritual Practice” will be the sermon by UUSJ at the UU Congregation of Miami. Details are here on the UUCM Facebook page. Following service will be a letter-writing opportunity. Showing of the 60-minute documentary “The Yard,” followed by a three-person panel discussion. Description: A history professor in Memphis Tennessee discovers that the parking lot of the church he attends used to be a slave yard belonging to a general in the Confederate army. Click here for more information. Suggested Donation $10. Suggested reading: The Empowering Internet Safety Guide for Women. Written by women for women and empowering women to protect themselves online. Send your congregation's social justice news or announcements of upcoming events to info@uujusticefl.org by Feb. 20. What's Your State of Justice?